Piano Festival on 7 and 14 of September 2014 | Piano Teachers' Guild of the Philippines Foundation,Inc. 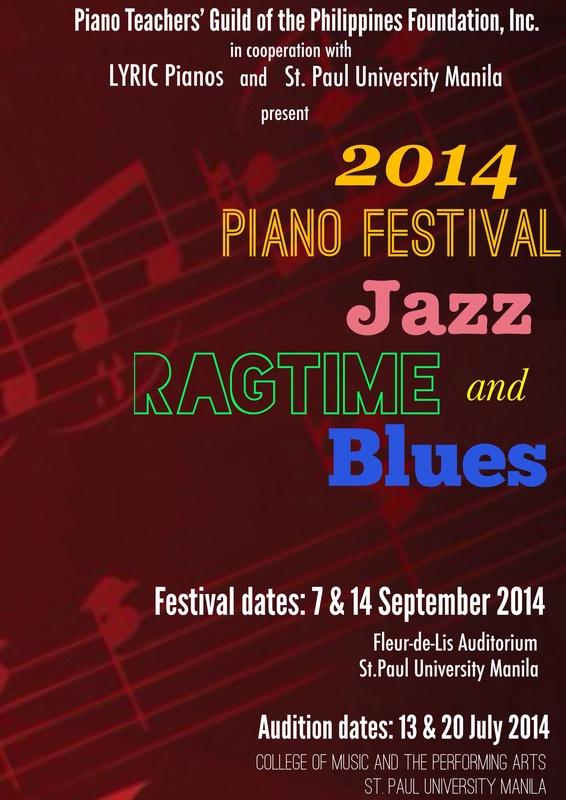 This is to announce that our annual piano festival will be held on 7 and 14 September 2014, Fleur de Lis Auditorium of St. Paul University Manila 680 Pedro Gil st. Malate Manila 1004. The theme for this year’s festival is Jazz, Ragtime and Blues. We discourage the use of Method books. Instead, we suggest you use supplementary books for beginners. Piano pieces that are not aligned to the theme will still be accepted. Auditions will be on 13 and 20 July 2014, Sundays 9am till 3pm at the College of Music and the Performing Arts of Saint Paul University Manila.Registration fee is 800php per participant. Walk-in auditions will be accommodated on a first come-first served basis. Payments will be accepted on the audition dates 13 and 20 July 2014. Yes! The festival is open to pianists age 5-25 as long as the teacher is a member of the guild. Yes, you may play Classical pieces. Then you cannot join. Better ask your teacher to join the guild, otherwise you cannot join. Go to the upper right corner of the website and click on PTGP MEMBERSHIP FORM for more info. You can play 2-3 pieces, as long as it will not exceed 5 minutes TOTAL PLAYING TIME. You may play 1 or 2 or 3 pieces as long as it will not exceed 5 minutes TOTAL PLAYING TIME I hope this clarifies any questions regarding HOW MANY PIECES you need to play. again, pwede pong tumugtog ng ISA, DALAWA o TATLONG pyesa HUWAG LANG PO LALAGPAS sa 5 minuto ang LAHAT NG Pyesa kapag tinugtog nang lahat. There is NO REQUIRED NUMBER OF PIECES TO PLAY, there is only a REQUIRED MAXIMUM NUMBER OF MINUTES, which is 5 MINUTES AND NO MORE.